(Sept. 14, 1944/Oct. 18, 1945) -- Pfc. Harry Nyegaard of 329 Main Street, Belleville, N.J., was killed in action on June 19, 1944, on the Tinian Islands in the Saipan campaign, while laying a communications wire between a battalion command post and a company in the field. Nyegaard graduated Belleville High School in 1942. In December that year, at age 17, he enlisted in the U.S. Marine Corps Reserves. He went overseas with a field communications unit. He was a veteran of Saipan, Kwajalein, Namur and Roi, all in the South Pacific. Navy Secretary James Forrestal personally signed the citation for Nyegaard's Silver star. Nyegaard had already received a Purple Heart and a copy of the Presidential Unit Citation in which the commanding general of the 4th Marine Division gave recognition to the young Marine. 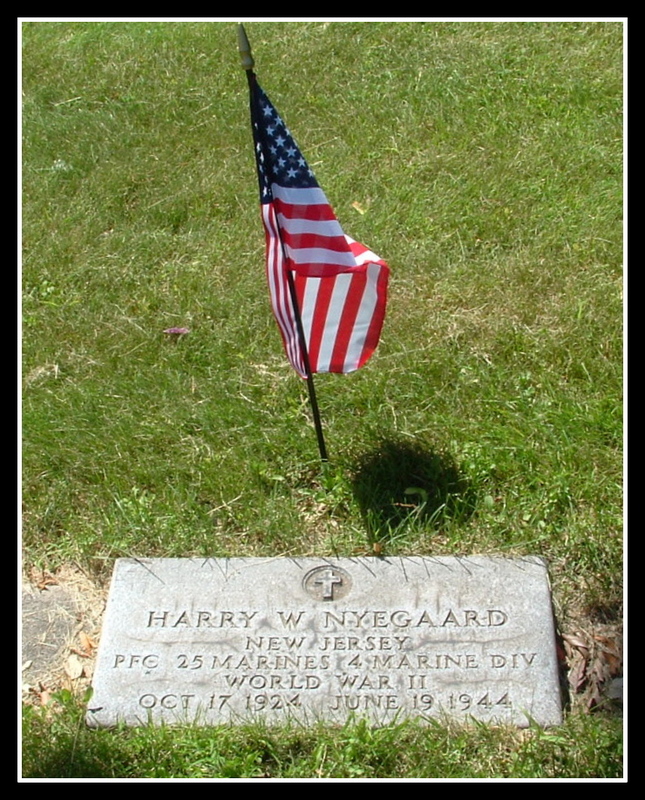 His parents, Mr. and Mrs. Harry J. Nyegaard, weren't informed of his death until September 1944. His brother, Vincent, a Motor Machinist's Mate 3/c, serving aboard an LSM fro Luzon to Japan, visited his brother's grave in Manila a month ago.